Secret diplomatic moves were under way to enable Col Muammar Gaddafi to leave Libya and seek temporary asylum in a sympathetic country. A convoy of vehicles said to be carrying cash, gold and senior members of Gaddafiâ€™s inner circle travelled across the Libyan border and into Niger late on Monday, starting a diplomatic scramble to resolve his fate. Talks have been taking place over a deal to ensure the deposed dictator escapes a final reckoning with the rebels, so sparing Libya any further bloodshed. However, it is understood that the negotiations have yet to resolve the former leaderâ€™s final destination. â€œThe deal isnâ€™t cooked yet,â€ an official familiar with the negotiations said. Claims that the talks were being brokered by South Africa were denied. The tiny Saharan state of Burkina Faso appeared to have distanced itself over the suggestion that it might let Gaddafi into its capital. Its officials told diplomats that its position as a signatory to the ICC meant it was not in a position to give Gaddafi guarantees on his status. Alain Traore, a government spokesman, said: â€œWe cannot grant him asylum because for the past three years we have not had good relations with him. Western officials said Gaddafi was continuing to refuse the offer of escape from the rebels and that they did not believe he had been on the convoy that crossed into Niger. Those who had fled so far were Gaddafi commanders and state propaganda officials. â€œThere is no way that members of the Gaddafi family are on that convoy,â€ one official said. Washington also dismissed speculation that a deal was sealed and reminded neighbouring countries that leading Libyans were subject to a travel ban. Victoria Nuland, a spokesman for the US state department, said senior officials of the ousted regime were in the convoy. There had been French-led pressure on Nato planners not to target the fleeing convoy. â€œThe French have been very active within Nato to ensure that the convoy, while it was tracked, was not subject to any air strikes or other action to stop it leaving,â€ one official said. French military commanders had hinted in Paris that Gaddafi and his son, Saif al-Islam, were holding open the option of joining the convoy at the last minute. A Nato spokesman pointedly declared the alliance would not attack Gaddafi loyalists that were clearly leaving Libya and the field of battle. â€œOur mission is to protect civilians not to track and target hundreds of fleeing regime leaders, mercenaries, military commanders and displaced people,â€ the spokesman said. However, efforts by Gaddafiâ€™s former allies to spare him from a final stand have not ended with the demise of his regime. Last month, two South African aircraft were on standby in Tunisia ready to fly Gaddafi to Zimbabwe or Angola as part of an African Union plan to resolve the crisis. 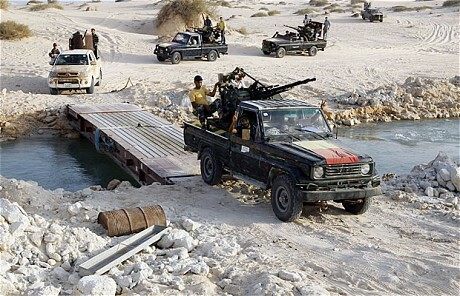 However, the rebelsâ€™ rapid assault on Tripoli cut off the escape route west into Tunisia, forcing Gaddafi family members to flee south instead. The loyal retinue of Gaddafi relatives has finally peeled away, scurrying south and west to an uncertain future.